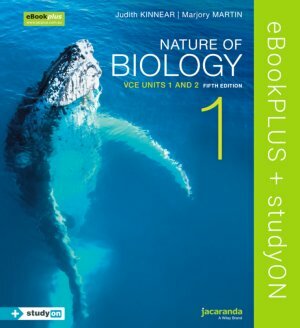 Nature of Biology 1 5E VCE Units 1 and 2 eBookPLUS with studyON VCE Biology Units 1 and 2 (Online Purchase) provides comprehensive coverage of the new VCE Study Design for 2016-2021. It includes Jacaranda’s unique exam preparation tool, studyON, which has been fully integrated with the text to maximise every student’s opportunity for exam success. • The theory is written by highly experienced authors with a proven and fundamental understanding of how students learn and succeed in exams. • Quick check revision questions throughout the chapter check and challenge students understanding. • studyON VCE Biology Units 1 and 2 is fully integrated with the student text. studyON is Jacaranda's unique study, revision and exam preparation tool. Students can rely on Jacaranda's dedicated customer service and support. This resource is a comprehensive digital-only product that includes studyON VCE Biology Units 1 and 2.